Family Formals portraits will be one of the most important puzzle pieces you’ll have to make sure fits perfectly on your wedding day. There are plenty of ways to schedule them and plenty of ways for them to become a true disaster. This is one of the reasons when choosing your wedding photographer, you need to pick one who is experienced and understand how to make this flow the most efficient way. In five years I’ve perfected how I prepare my couples for this moment. The wedding day is a hectic day, full of guests wanting to congratulate you, hunger (yes, hunger) and a bunch of decisions that will make you forget who you had a photograph with and who you didn’t. Therefore, here are some of my tips to avoid family formals disasters. Make your formals list during the wedding planning. This is my biggest trick. 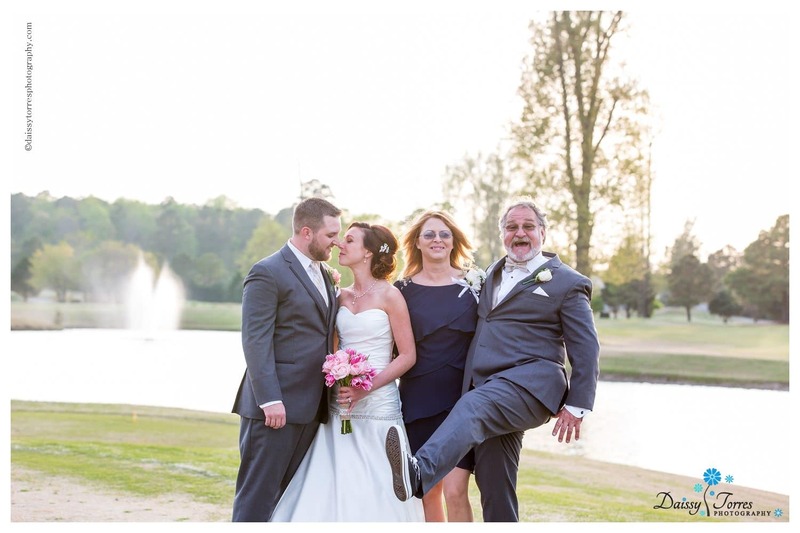 All my couples make their family formals requests during our wedding photography planning. If you don’t do this, you will certainly forget someone during the wedding day. Although we cannot pick which family we were born into, we can indeed pick and choose during Family Formals. Forget the cat or the cousin you have not seen in forever and won’t even call back during Christmas. Rule of thumb: If they don’t call during Holidays, do not include them in your family formals. Keep the family formals simple. Include those closest to you and those you most likely would include in your wedding album. These are usually Parents, Grandparents, Siblings, family who walked down the aisle with you, and Bridal Party. Pictures with all others, including coworkers etc, can be taken during the reception time. We will always take pictures of you and your love with each parent separately unless you request otherwise. An outdoor location is usually best for relaxed and natural family formal portraits. If weather does not permit it, choose an uncluttered large space indoors with a neutral background. Family formals is one of the things you cannot get away from and require the most time, so schedule as much time as you can for this. If you will be doing all your family portraits during Cocktail Hour, keep in mind you will have to divide the time between family formals and couple’s portraits. Therefore, having too many family portraits scheduled can potentially leave you with no time for portraits of the two of you. Pick your formals and time wisely. When you have a first look, not only will you have extra time for couple’s portraits, but you can also schedule all your family formals before the ceremony. If you are not considering a first look, have all the family formals, that do not require your Love to be present, done before the ceremony. Photos of you only with your parents, siblings, grandparents and your I Do Crew, should be done before the ceremony. We will repeat the same thing with your Love. That way all you will need is one picture of both families combined and one picture of the bridal party combined. Once we have all the desired family formals, I will make a list in the order I will call them. This helps keeps the flow and that way we are sure we are not missing any request. 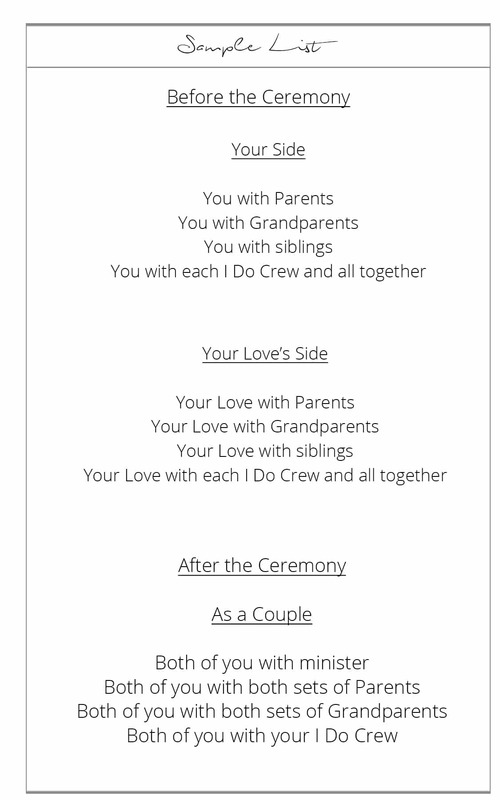 I recommend to print out the list I will send you and share it with your family during the rehearsal dinner. This will help them know who has to be ready early, who will be needed for pictures and when it will happen. I will take your future heirloom pictures but allow your family to be themselves. You will miss them as they were. You and your love will always be in the middle. Everyone else must turn slightly towards the two of you. Example: Have the moms on each side? They both need to be slightly towards the both of you. You and your I Do Crew will need bouquets during this time, if applicable. This may be weird, but everyone must be touching one way of another and stacked is even better. Hands must be doing something. Example: Males with one hand in pocket, mother and daughter holding hands, holding bouquet together, etc. All hands most have an end game! Family is family. Hug one another but if they have a jacket, only one hug allowed. Otherwise the jacket opens and it looks like they are superheros ready to change clothes. Let people tuck their shoe under your dress instead of making a space to avoid them stepping on it. This helps with closeness. Nobody will believe you love each other if you are 24 inches apart. Purses, phones or anything in pockets need to be out and on the side. Set it behind you, put it in your back pocket or give it to a trusty person. Whatever you do, do not have them in your pocket. For a group of 10 people or more, taller people go in the back. Keep those eyes on the camera! If there is no wondering eyes, things will go faster. You will have 3-10 pictures taken per group to make sure we have a full body, a close up and a vertical. Plus, that way we make sure everyone’s eyes are open. Family Formals time is the most exhausting time of the wedding. Your lips will hurt because of all the smile, you will be hungry, and you will wish I was a superhero that took pictures in 1 minute. However, we’ll have fun! I’ll joke around and look for the little moments in between the posing and the smiles. Come prepared to enjoy yourselves.